I was inspired to make this card by a challenge which required the use of newsprint. I also like to have at least one sympathy card 'on hand'. The sentiment stamp is part of a retired Layers of Color set, designed by Nina Brackett, which I gold embossed. The final details were the gold sequins and the single line frame. I love trying new techniques, and I learnt this one at a craft show some time ago. It uses Opalite Reflective Interference ink pads on glossy card stock. This time I used black for my base. and this was layered onto an embossed blue paper, and a slightly darker blue card base. Ribbon and pearls were added to finish the card. This is a masculine card that started with the paper that came as a freebie years ago from Paulette at Create with TLC, called Dad's Honey Do Paper. I teamed it up with some gray card I embossed with a retro squares folder. I then cut several pieces of blue card with a SB zig-zag edge die to form some borders. and then the final layer was an embossed SB label cut from silver card, with a blue embossed sentiment. All cuts were made on my wonderful, faithful Cuttlebug. The final touch were some black half pearls. I don't think I have ever used so many layers to form a masculine card, but I was more than happy with the outcome. I made this card for a young boy who is very keen on archery. I started by embossing only part of the Sycamore tree folder, and chalking the trunk and branches with a cotton bud (Q Tip)to make it look as though it is starting to leaf up, being spring here in the Antipodes. To ensure the card looked authentic, I researched (Googled) the colours of the archery target before I started - four die cuts later (s/b circles through my trusty Cuttlebug) and I had the target, then some strips of brown card were added for the legs. The arrow was stamped and gold embossed, then trimmed to fit the card. The sentiment was also gold embossed, and the panel mounted on an orange base. I had some pieces of paper left after the class I took making these patchwork butterflies, so I made another set, again painting them with iridescent medium to give a gorgeous shimmer. This time I mounted them on a cream card-stock I had embossed with the fantastic flowers folder, then the patchwork frame and dark pink background. The sentiment, stamped in Worn lipstick, had been clear embossed before the card was embossed. The final detail was a three layered flower, held together with a clear gemstone topped brad. This is the second card I taught this week, and we tackled the 'dreaded masculine card', and conquered it. We started with a piece of embossed kraft paper from a Tim Holtz pad I brought years ago, which we sponged with Distress Inks - Broken China, Spiced Marmalade and Bundled Sage. The fisherman image (a Kiwistamping Image)was coloured with prisma coloured pencils, and the fish painted with grey Kohinoor watercolour paint and over painted with Oyster Twinkling H2O's. The sentiment was embossed with copper embossing powder, the panel sponged with Spiced Maramlade DI, and adhered to the side of the image panel. The final touch was this starfish charm, attached with some pearle thread - you can see the embossed paper behind the charm. who is also supplying the prize of $US10.00 worth of images from her store. The image I chose was one of pansies, one of my favourite flowers. I made my own background by chalking a cloud background. The pansy image was coloured with Prisma coloured pencils, then painted over them with some iridescent medium, and the edges then had clear KindyGlitz added. These were fussy cut, and mounted over a die cut that was made with glitter card. The final details were some sequins and a wee bow. The sentiment is from a Unity Stamps set Love, joy, Peace (now retired). I masked off the final line of the sentiment as 'happy holidays' is not used as a Christmas greeting in New Zealand. The tree image from the same set was stamped in Gold Delicata ink - here you can see the sheen it gives, Both the image and sentiment were layered on dark green card before being mounted on the red. and I randomly applied gold kindy glitz to some of the embossing on the red panel. I was a bit stuck for inspiration when I started this card, so started with the Little Butterfly image from Meljens Designs, painting it with twinkling H2O's, and after cutting it out with a Spellbinders labels eleven die, chalking the background with blue. This was mounted over some patterned paper, and then onto a purple base. This card was made using a recycled image from a commercial card as the focal point. The image was fussy cut and mounted off the edge of an orange oval, cut with a spellbinders die. and mounted over a Shaving Creme background I made some time ago. The brads were plan brass ones, so I heated and embossed them with Tinsel Green embossing powder. Welcome - I am so glad to have you visit. I kept to the basic sketch with the circle and tree shape, and a kraft background, which was a sheet of paper from a DCWV Printed Kraft stack rather than stamped layer as in the original. I used a Flourishes stamp for the tree from the set Love, Joy, Peace, which appears to be retired. The (coloured rather than natural) bakers twine was wrapped around the layer rather than just used as a bow. The tree was stamped using the rock and roll technique, with two colours of green, then over-stamped with clear embossing ink and clear embossed, which gave an interesting finish. Once fussy cut, I mounted the tree with heavy glue dots, which gave a little bit of dimension. I stamped the sentiment on two small banner shapes and after sponging the edges, they were attached with brads, and left flat. I also put brads in the corners of the top layer. The circle was cut from a textured wall paper, which also has a slight gold fleck in it, which can just be seen in the above photograph. This is my contribution to World Card Making Day. As I needed a card for the sweet two year old this weekend, this is the outcome. The image is from May Britt's Blog - over the years she has given away quite a few of these sweet teddy bear images. It is coloured with chalks (pastels) and the sentiment gold embossed onto the chalks. I added Kindy Glitz to the ribbon, and mounted the image over a S/B Lacy square cut from glitter paper. The light panel was embossed with the Fancy Lattice folder from S/B, which I had inked with spun Sugar DI before I embossed it. The flowers were then touched with some iridescent medium to add some shimmer. The final details were two ribbons, one gathered onto elastic, and then a stitched one on top of that again, finished with a matching bow. Ribbon, Flower and a Button. The challenge is to use a colour palette or bingo, or if you are feeling super creative, both. 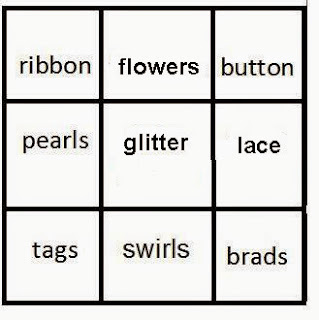 I took the bingo challenge and used the items on the top row. I started with the panel that had been the result of a 'play' in my studio some days ago when I sprayed a stencil with Adirondack colour wash in Red Pepper, and then with a quick spray of gold shimmer mist, which really does not show in the photos. This was followed by a layer of modelling paste applied through another stencil. At the bottom of the stencilling I added some vellum (Spell Binders) die cut leaves, and then a stack of three paper flowers, and a button threaded with ribbon, held with glue dots. The final detail was the sentiment stamped on a hand made tag, with the corners rounded and the edges sponged with the same ink I stamped with. The recipients loved it - which always makes me happy.